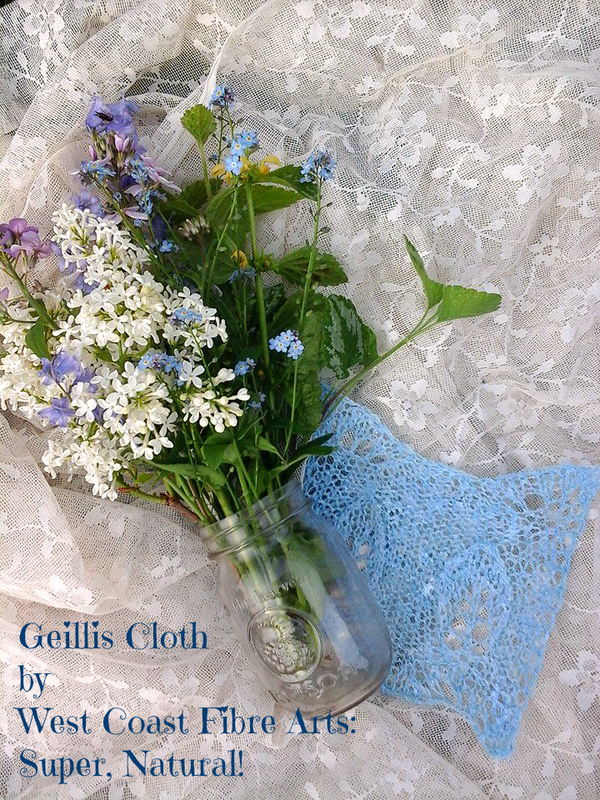 I had hoped to have this pattern published earlier in the day–I’m just a few minutes late for the first day of summer with the “Wrinkled Shell Cloth” ! 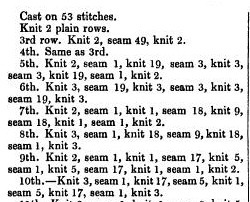 Making a cloth is a useful way to learn new stitches and this cloth is an interesting combination from the 1880s. The pattern will be available free, to celebrate the beginning of summer, for just one week. I hope you will take the time to visit my Facebook Page to find the code you’ll need…and show support and help me by hitting the ‘Like’ button on Facebook and adding the design to Favourites on Ravelry as well 😉 Thanks! Put June 20th on your memo pad… it is the first day of Summer and you’ll find lots of ways to celebrate. 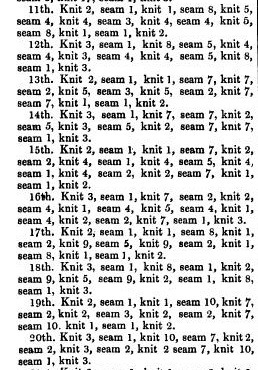 Once you start browsing through Victorian knitting stitch instructions you can find quite a few “diaper” patterns. This does not refer to making babies garments, but to stitch patterns that use knit and purl stitches to make a regular, usually small-scale geometric design–the raised ‘bumps’ of the purl stitches against flat knit stitches form diamonds, triangles, squares, etc. “Damask” and “diaper” also refer to other needlework techniques such as embroidery and weaving–“damask” patterns were usually larger scale and more ornate. Here are 2 examples from Church Embroidery Ancient and Modern, practically illustrated; by Anastasia Dolby; 1867. Let’s return to knitting a ‘damask’ pattern! Here are the Rows for Day 2 of the Fleurs de Lis for Paris KAL. 11. k2, p1, k1, p8, k5, p4, k4, p3, k4, p4, k5, p8, k1, p1, k2. 12. k3, p1, k8, p5, k4, p4, k3, p4, k4, p5, k8, p1, k3. 13. k2, p1, k1, p7, k7, p2, k5, p3, k5, p2, k7, p7, k1, p1, k2. 14. k3, p1, k7, p7, k2, p5, k3, p5, k2, p7, k7, p1, k3. 15. k2, p1, k1, p7, k2, p2, k4, p1, k4, p5, k4, p1, k4, p2, k2, p7, k1, p1, k2. 16. k3, p1, k7, p2, k2, p4, k1, p4, k5, p4, k1, p4, k2, p2, k7, p1, k3. 17. k2, p1, k1, p8, k1, p2, k9, p5, k9, p2, k1, p8, k1, p1, k2. 18. k3, p1, k8, p1, k2, p9, k5, p9, k2, p1, k8, p1, k3. 19. k2, p1, k1, p10, k7, p2, k2, p3, k2, p2, k7, p10, k1, p1, k2. 20. k3, p1, k10, p7, k2, p2, k3, p2, k2, p7, k10, p1, k3. Please don’t forget that my pattern is Copyright. If you want to share the information please share a LINK to my blog, do not embed or copy & paste the pattern–that’s illegal and just not nice 🙂 I have put many hours into rewriting and knitting these patterns to ensure as few errors as possible; when I find ‘free’ patterns being shared illegally, I change them to ‘paid’ patterns to compensate for all the hours I must spend writing to internet service providers to get the patterns removed. The Fleur de Lis was a popular design element in Victorian needlework patterns. 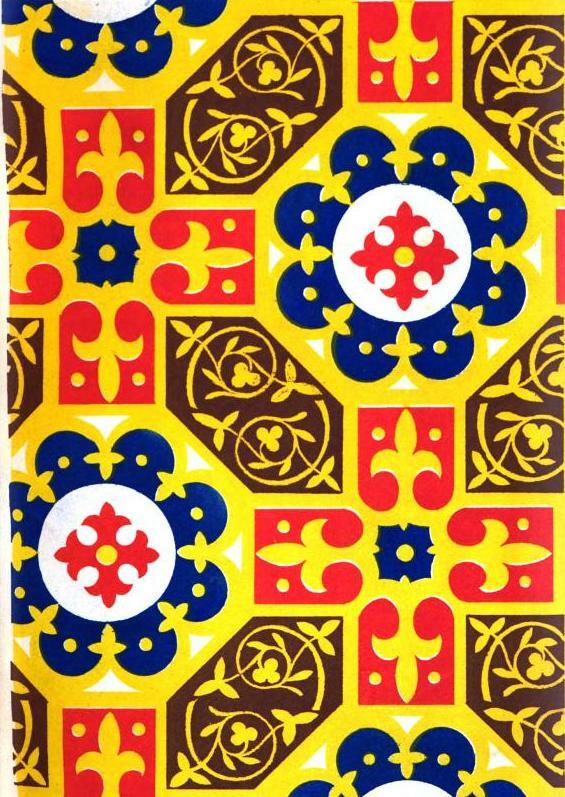 As another example, here is a colourful design intended to be embroidered on canvas, from needlework pattern in The Work-table magazine of church and decorative needlework, by Mrs. Mee and Miss Austin; Bath, England, 1847. Like the counterpane design, it features a symmetrical pattern with 4 fleur de lis lilies in each group. You may choose to knit directly from the original pattern; or knit using my rewritten pattern. I hope you will take the time to search for the original design and look at it, and be inspired to search for other antique patterns to try, as well. The link is given in yesterday’s post. I have made a Ravelry pattern page for this rewritten design. I hope you will take the time to add it to your ‘Favourites’–just click that little heart 🙂 — or queue; and if you make it, please link it to my pattern. It is nice to feel appreciation 🙂 I also have a Group on Ravelry you are welcome to join. Though there hasn’t been much activity on it, that can only be changed by more people interacting. You are also welcome to share photos on my Facebook Page–the feed is shown on the right hand margin of the blog. When I have finished rewriting and reworking it, I will add a pdf file to the Ravelry page. Meanwhile, each day I will add more lines here on my blog. Please remember that I am an older grandmother, and my health is not as reliable as it used to be–there may be a day I have to miss posting a few new rows; but please be assured that I will add them as soon as possible. If you find any more errors in my rewritten pattern rows, please send me a message on Ravelry or on my Facebook page—Facebook is usually the quickest way to get my attention, just send a personal message. My original recreation uses Bernat Handicrafter Cotton, worsted weight, 100g for 1 square and an insertion strip on just 1 edge. I used 3.75mm needles, and the overall size, blocked, is about 15 inches X 19 inches. I am using Aunt Lydia’s Bamboo Crochet Thread (a size 10 thread) and 2mm needles for my KAL version. The main square will be approximately 6 inches X 6 inches. I’m also making a Tote Bag with Red Heart Super Saver Solids in aran colour; with 4mm needles. I’ll need to make 2 squares, plus a strip of the insertion to form the shoulder strap, bottom and sides of the bag. You can see my project here on Ravelry. k2, p1, k19, p3, k3, p3, k19, p1, k2. k3, p19, k3, p3, k3, p19, k3. k2, p1, k1, p18, k9, p18, k1, p1, k2. k3, p1, k18, p9, k18, p1, k3. k2, p1, k1, p17, k5, p1, k5, p17, k1, p1, k2. k3, p1, k17, p5, k1, p5, k17, p1, k3. This pattern, photos, and items made from this pattern are protected under Canadian Copyright Law. THE ORIGINAL DESIGN, IN ITS ORIGINAL FORMAT, IS NOW IN THE PUBLIC DOMAIN AND YOU MAY FIND IT ONLINE AT THE ORIGINAL SOURCE AND WRITE OR PUBLISH YOUR OWN INTERPRETATION OF THE WORK. MY REWRITTEN DESIGN, INCLUDING MY PHOTOS AND WORDING OF ERRORS FOUND, ETC., ARE NOT IN THE PUBLIC DOMAIN AND ARE COPYRIGHT TO ME. THEY MAY NOT BE COPIED AND USED IN ANY WAY. THEY ARE FOR YOUR OWN PERSONAL USE ONLY. THANK YOU FOR TAKING THE TIME TO READ THIS. [i] Cover illustration: from needlework pattern in The Work-table magazine of church and decorative needlework, by Mrs. Mee and Miss Austin; Bath, England, 1847. An easy and fun way to make a d’oyley that you don’t have to re-starch! This would be pretty framed, too. 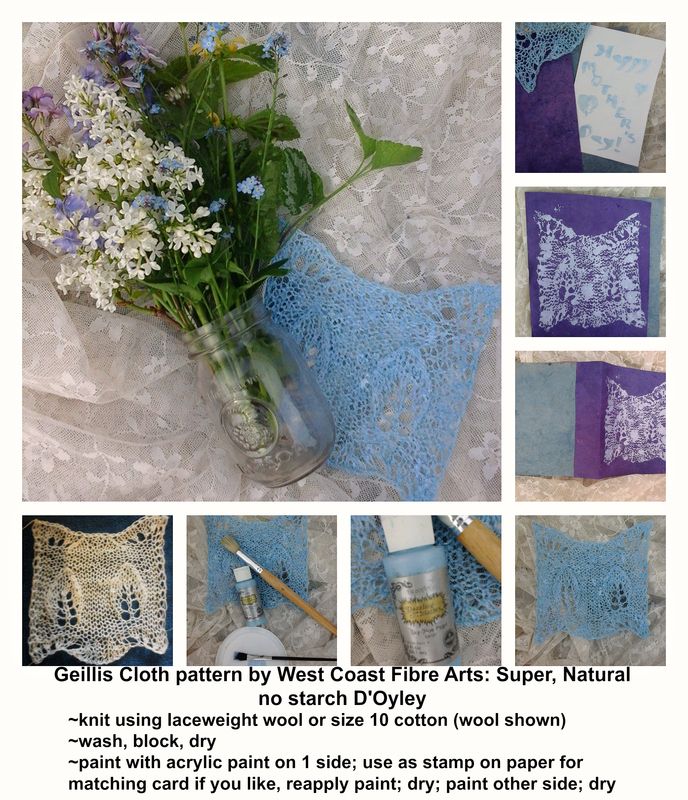 See this FaceBook post for how to get the pattern free only today May 10/2015 ~ Happy Mother’s Day! Victorian Flowers: Mavourneen 1 pattern is in the Pattern store now. It is the first motif for an Irish Crochet style D’Oyley–there are 15 more, and some of the motifs require that more than one be made the same. 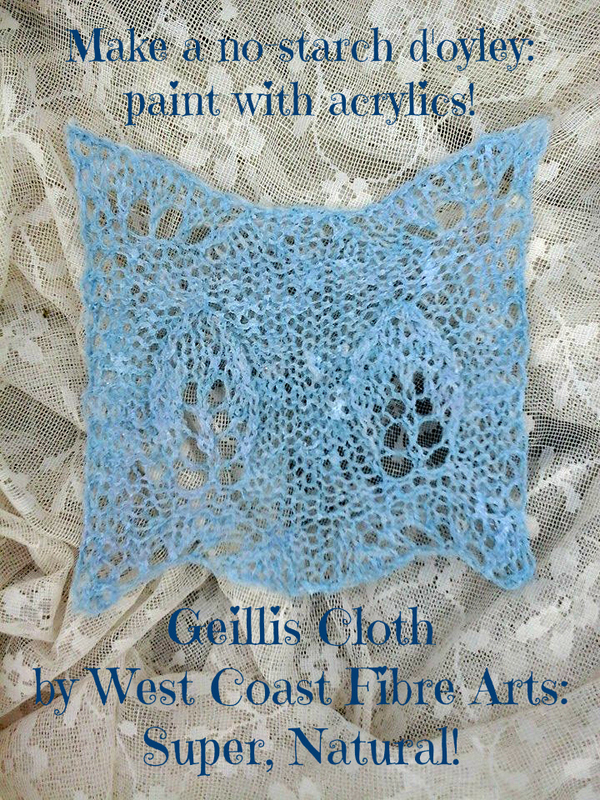 I hope you will join the new Facebook West Coast Fibre Arts KAL & CAL Group and share photos and comments and make this d’oyley with me! The coupon code to get the new pattern free for the first week is in the Facebook Group and also in the Friday Flowers thread in the Ravelry Group. Next week the coupon code to get the pattern free will be offered in a different way–I am just sorting out the details so please look on here next week for the Coupon News!